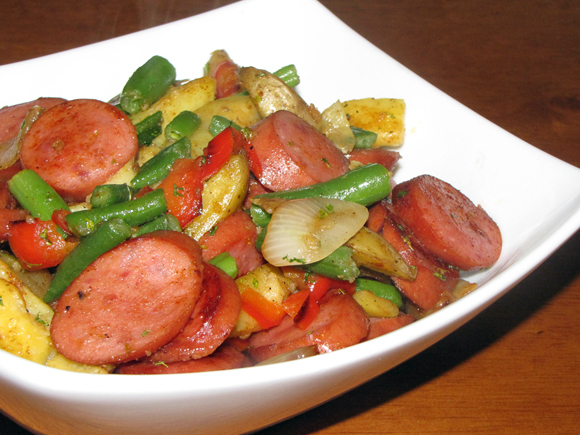 There is so much flavor packed into this simple dish and it can easily be adapted with your own favorite vegetables or sausage. The adults will love it, the kids will love it...it's a win/win for everyone! 1. Prick potatoes and cook in the microwave for three minutes to jumpstart cooking. 2. Meanwhile, slice sausage and veggies. 3. When potatoes are done, let them sit a bit until cool enough to handle safely. Cut into wedges. 3. Heat butter and oil in large skillet over med-heat until melted. 4. Add potatoes, onions and peppers and cook for a couple minutes until everything is starting to brown and onions are starting to soften. 5. Add sausage and beans to pan. Sauté for a few minutes until heated through. 6. Next add the spices and seasonings and cook for a few more minutes until everything is nicely browned.